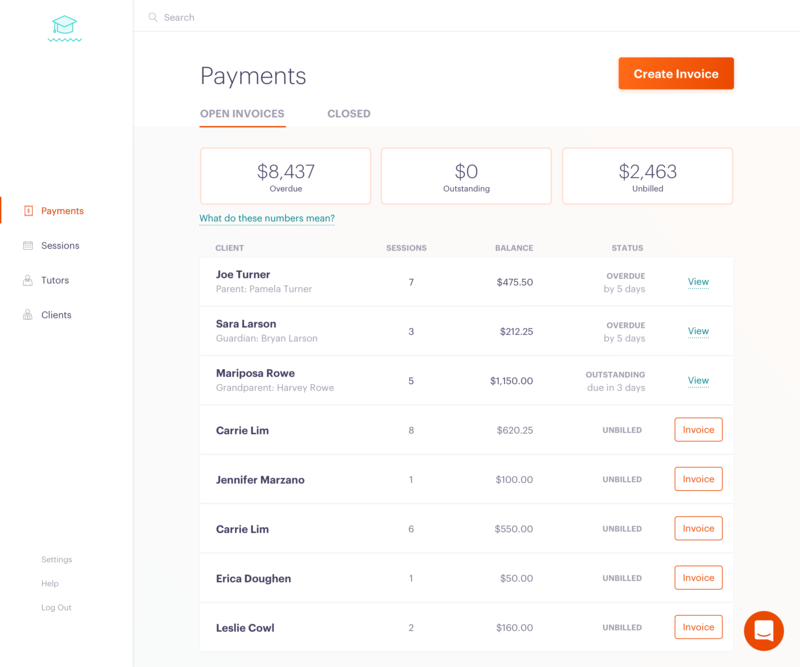 Send invoices and keep track of payments. The Payments page is where you'll find financial information on your company. Here, you'll see information about invoices and revenue. Along the top you'll notice totals for Overdue, Outstanding, and Unbilled. The Overdue amount refers to the sum of all outstanding invoices that are past due. This is money clients owe you that they are late to pay. The Outstanding balance refers to the sum of all outstanding invoices that are not overdue. This is a reflection of the amount of money you are owed that is in good standing. The balance labelled Unbilled refers to the total amount of revenue generated from all sessions booked minus Outstanding + Overdue balances. 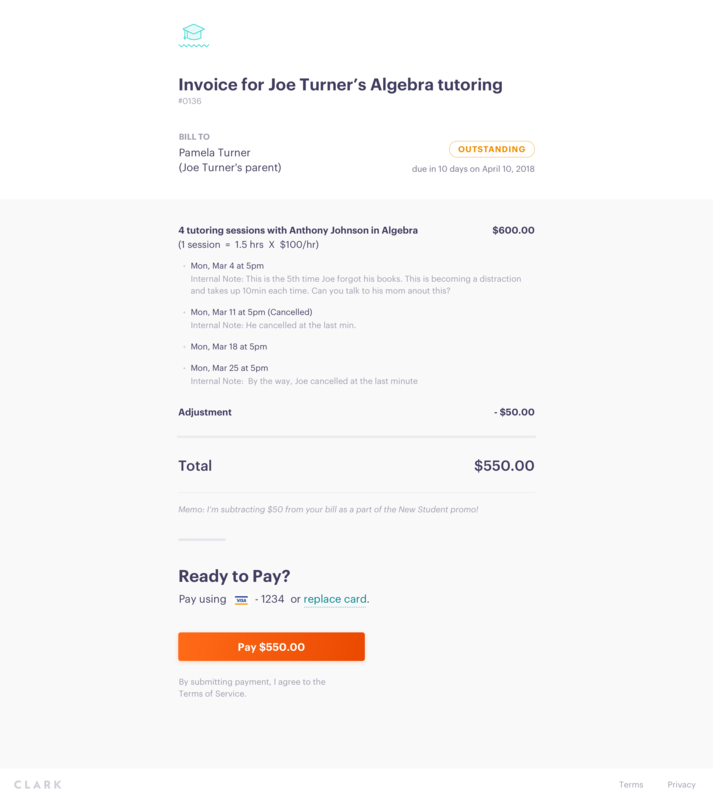 Similarly, invoices that have been paid are displayed in the Closed tab. Once a session has been logged for a unique student, that session will be added to the student's account as displayed above. Follow the instructions below to create an invoice for each client. 1. Select 'Invoice' on the client you would like to bill. 2. Assign a Due Date for the invoice. 3. Select the number of sessions for which you would like to bill the client. 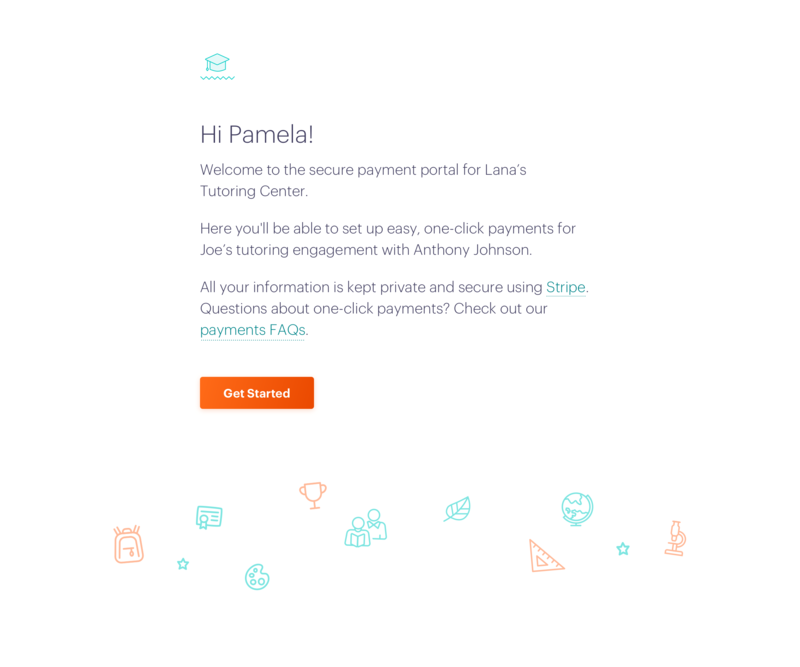 *Note: The system will automatically populate the invoice with the student's unbilled sessions. You can remove any of these sessions by decreasing the number of sessions you would like to bill for in this invoice. 4. Create an adjustment if necessary. 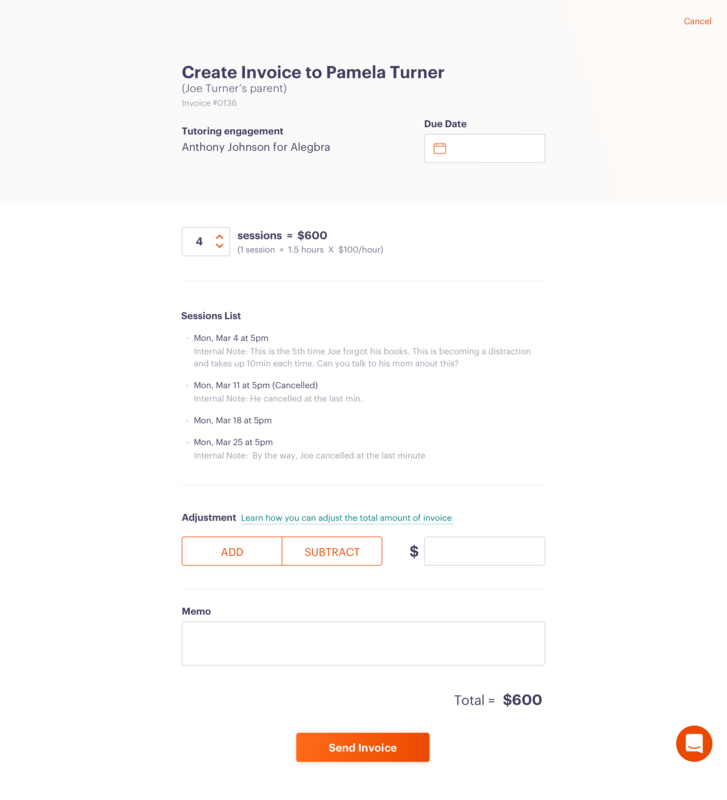 Similarly, if you would like to create a new invoice that is not based on a prior engagement, you can do so from the 'Create Invoice' icon in the upper right-hand corner. My client never received my invoice. What should I do? First, be sure that they've checked their spam folder. It sounds simple, but it often solves the problem! If they're still unable to locate the invoice, you can forward it to them from your own email address. All administrators are BCC'd on invoices and receipts, so you can search your inbox and resend if necessary. If you're still having trouble, click the chat icon in the right-hand corner of the screen, and a member of Customer Success team will be ready to help. 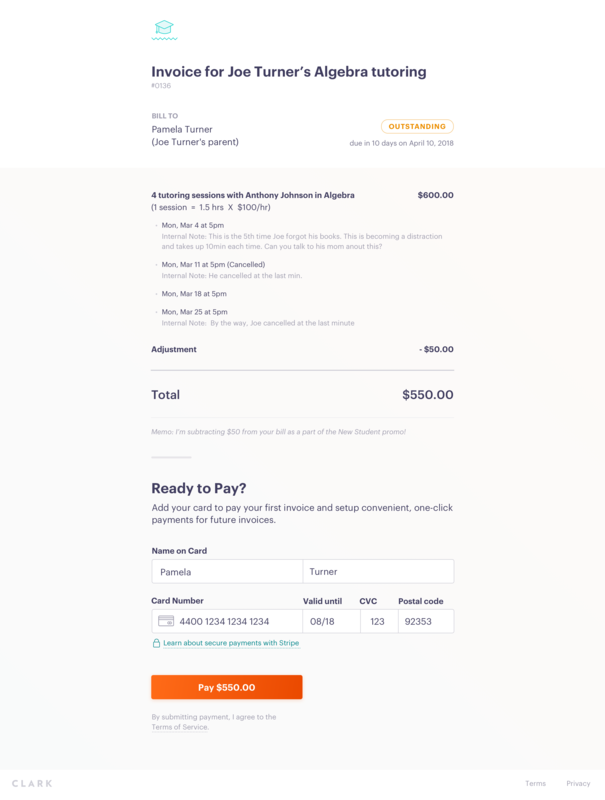 If you’re billing a unique client for the first time, we'll send them an email introducing them to online invoices. Your client will then add a form of payment and pay their first bill as shown below. Once you set up direct deposit, deposits to your account are completed within two business days, with the exception of bank holidays. Remember, there is no action required on your end after you send the invoice. We’re more than happy to issue a full or partial refund. Simply visit Help or chat with us via the icon on the bottom right-hand corner of your screen. Refunds will process in 6-10 business days.